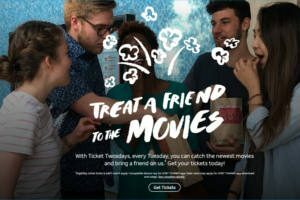 AT&T wireless customers, get your code valid for a Buy 1 Get 1 FREE Movie Ticket every Tuesday! to get started, text ATTTHANKS to 8758. Once you receive your validation code, you can redeem your tickets online. Limit one free ticket per account per week. If you prefer, you can use the AT&T App (available for iOS and Android devices) to get your code. Want to take a quick peek? Use your my AT&T login to explore your benefits. Sign in and redeem select offers now. I want the tickets for AMC being included with AT&T for the year of 2018-2019.